Aliko Dangote has revealed that he needs a new wife. Aliko who has been married twice and divorced disclosed this to David Piling in a Financial Times interview, Lunch with FT. The 61 years old also says he has not given up on buying Arsenal. 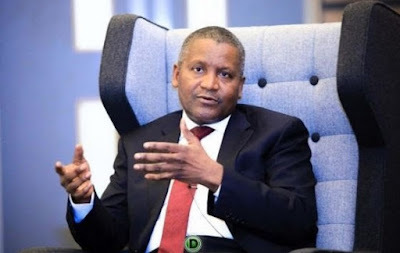 Dangote told Pilling that he tries to fast at least once a week, adding that “it helps to clean your system”. “When I buy it, I have to bring it up to the expectations of our supporters,” he said, stating that his refinery is priority now. “Once I have finished with that headache, I will take on football,” he concludes. » Ini Edo's Ex-Husband, Philip Ehiagwina Has Found New Love, Set To Re-Marry Soon. » Ladies, who would you marry between these men?